Good news across the board! Students, apprentices and staff are celebrating at Chelmsford College today, after receiving the official Ofsted report which grades the College as "Good" in their recent inspection. The inspection took place between Tuesday 12 December and Friday 15 December. Education providers are monitored regularly to ensure the standards of teaching and training remain high. Nine Ofsted inspectors interviewed groups and individuals and observed lessons and tutorials in College and in a range of workplaces. Self-assessment reports, development plans and the previous inspection report were all taken into account. 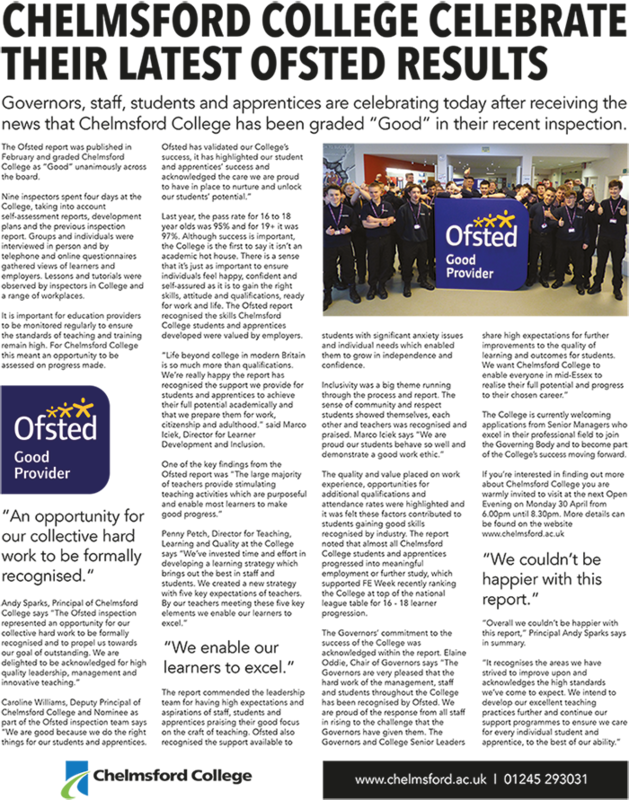 The inspection resulted in Chelmsford College being graded as "Good" unanimously across the board. The report shared several key findings, including praise for a good focus on the craft of teaching; support available to students with significant anxiety, to enable them to grow in independence and confidence; a strong work ethic; high attendance rates; high inclusivity; meaningful work experience and additional qualifications recognised by industry. The report supported FE Week recently ranking the College at top of the national league table for 16 to 18 learner progression, meaning that almost all Chelmsford College students and apprentices progress into meaningful employment or further study. Andy Sparks, Principal of Chelmsford College says "The Ofsted inspection represented an opportunity for our collective hard work to be formally recognised and to propel us towards our goal of outstanding. We are delighted to be acknowledged for high quality leadership, management and innovative teaching." Caroline Williams, Deputy Principal of Chelmsford College says "Ofsted has validated our College’s success. It has highlighted our student and apprentices’ success and acknowledged the care we are proud to have in place to nurture and unlock our students’ potential." The pass rate for 16 to 18 year olds at Chelmsford College was 95% last year. For learners aged 19 and over it was 97%. Approximately one third of students who joined College from school without their English and Maths GCSEs, achieved grades A* - C in English and Maths (which is the equivalent to the reformed 4 - 9). This reflects the national rate for resits. Almost 45% of students leave school without their English and Maths GCSE qualifications. The Ofsted report also recognised the high levels of inclusivity, sense of community and respect at the College. Last year, Chelmsford College received recognition from the Cabinet Office, being awarded “Champion College” status for their work in an Active Citizens programme. Marco Iciek, Director of Learner Development and Inclusion says "Life beyond college in modern Britain is so much more than qualifications. We’re really happy the report has recognised the support we provide for students and apprentices to achieve their full potential academically and that we prepare them for work, citizenship and adulthood." Andy Sparks says "Overall we couldn't be happier with this report. It recognises the areas we have strived to improve upon and acknowledges the high standards we’ve come to expect. We intend to develop our excellent teaching practices further and continue our support programmes to ensure we care for every individual student and apprentice, to the best of our ability."